I am trying to decide what to do with the sinamay hat I blocked last week. 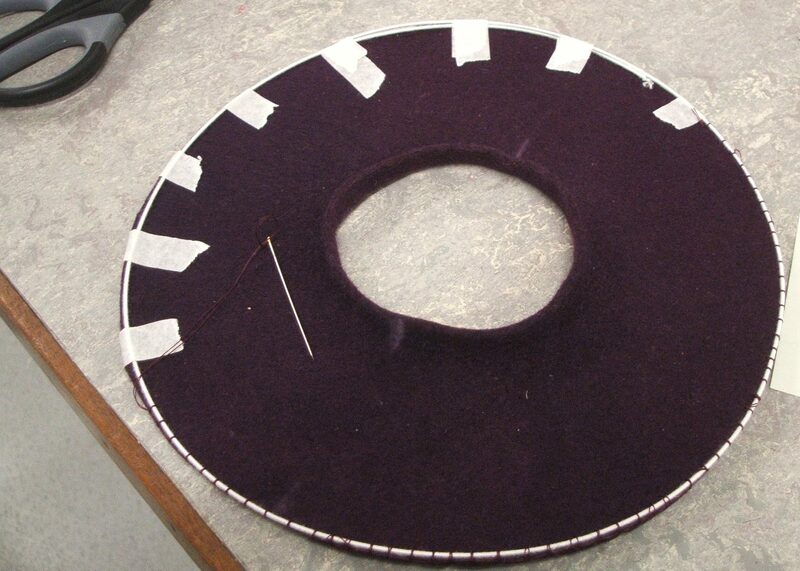 Our next project this term is to make a brimless blocked hat. I was late for class and ended up with a pointy block that looks like a helmet (as there are thirteen of us and a lot of blocks had already gone by the time I got there!) I actually quite like this block though. And I was amazed that all that tugging and pinning of a flat piece of damp sinamay could turn it into the shape you see in the first photo. It’s all to do with using the bias apparently. The sinamay is impregnated with a sort of glue stiffener a bit like PVA so you don’t need to stick the layers together and it holds its shape once it is dry. Number 1 was using the helmet idea (imagine that the tippex is actually gold). But to be honest I wasn’t keen so I tried a couple of slightly more feminine styles. I think that number 3 (front and back) looks the most stylish. 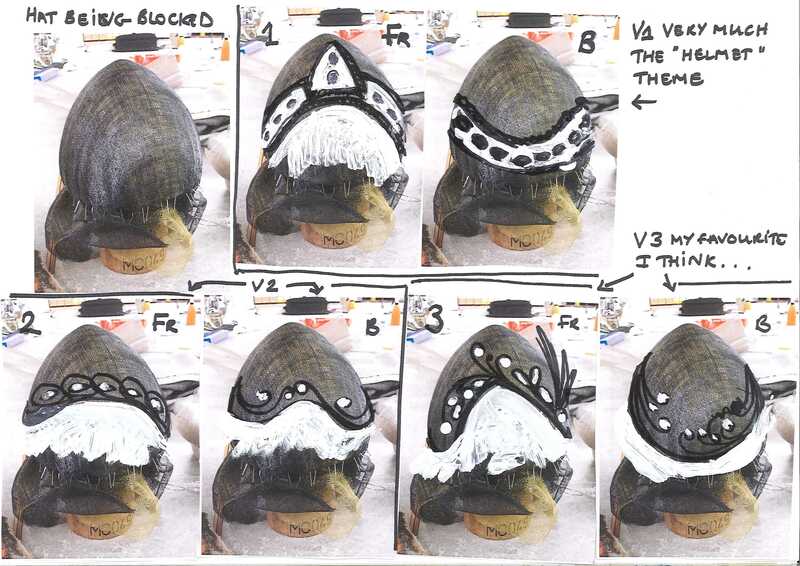 But I am still wondering about the helmet one – after all if it looks like a helmet maybe it should be a helmet. I could give it gold sinamay horns too!! The ‘flare’ and the ‘cone’ which I had stiffened previously were dry by the time last week’s class came around so I was able to steam and block the pieces of the hat. This happens in two parts – one block for the crown and one for the brim. Both of the official trilby blocks were a bit small and so was the trilby brim block with the best shape so we improvised. 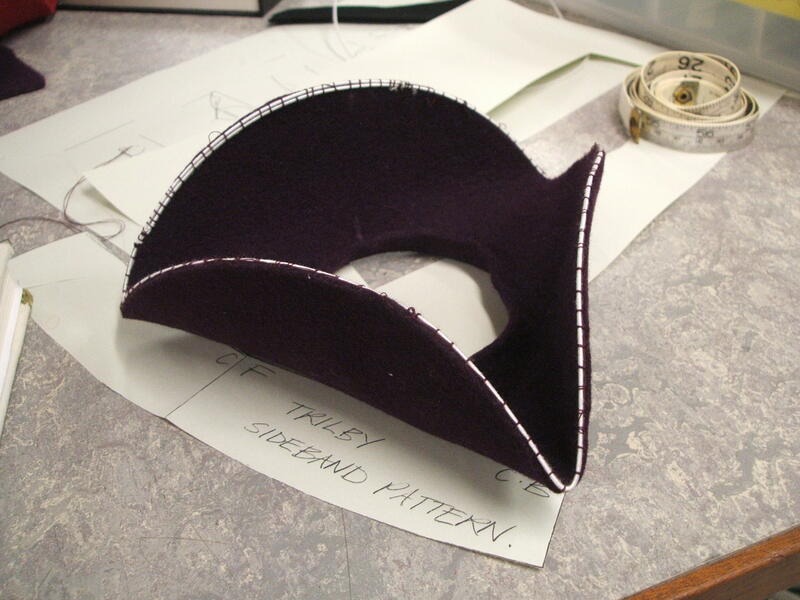 The brim is blocked onto a polystyrene copy of a 1950s Dior block once owned by Freddie Fox. I attached a crown block with the right head circumference to the brim block with masking tape and pins, to provide a guide to stretch the inner side of the rim over. Then I cut the middle out of the flare and stretched it over the crown block steaming it as I went – very glad I was using a polystyrene version as the original block must have weighed a ton and would have been hell to manipulate! We then wrapped a cord around the middle and pinned it into the block securely. Finally once it was stretched at the crown edge I steamed smoothed and stretched the brim over the block, pinning as I went. And now I wait to see what happens in tomorrow’s class as it will have dried thoroughly and can be removed from the block to be cut to shape and stitched together. In July there was an article in the Tower e newsletter and I went to the August Meet only to discover that they meet on a Wednesday – the same evening as the Millinery Class I had just signed up for… However I made it to the October meet as they had it late and so it coincided with my half term. 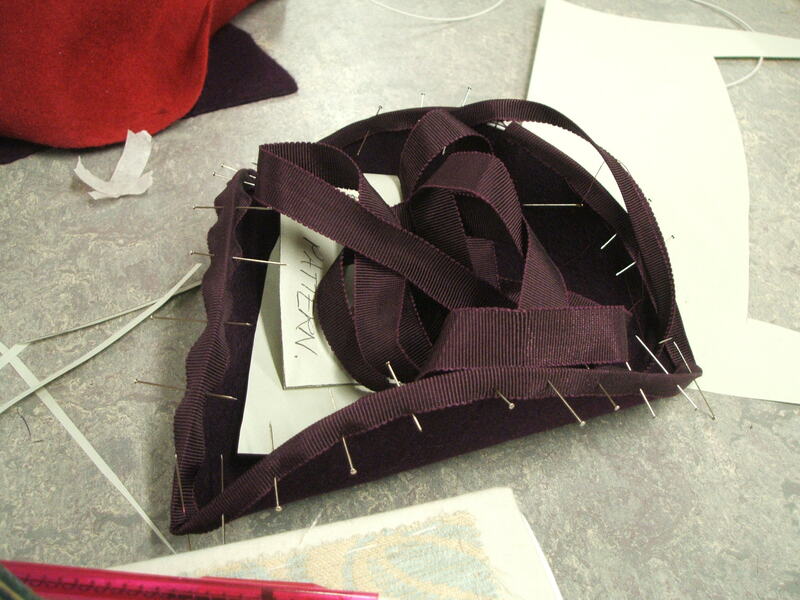 I miss the ‘sitting around a table working and chatting’ element of my embroidery class. (We don’t know each other well enough yet in Millinery to be idle chatters – plus we are constantly learning stuff.) I’m not convinced that a pub is the best of venues for craft – the lighting leaves a lot to be desired! It’s not too bad if you are knitting or crocheting, but threading a needle is a bit of a challenge!! I learned this week in my millinery class that there is one word that is definitely not to be used there – ‘fascinator’ otherwise known by our tutor as ‘The F word’…. !! 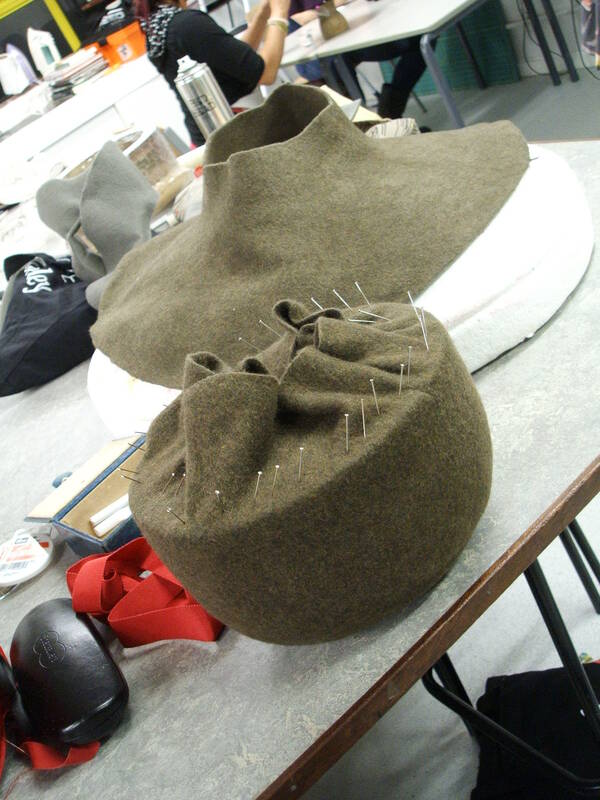 The subject came up as we are all currently making small constructed hats – the exercise is being used to teach us basic skills like wiring a brim or edging with petersham ribbon, but in a way that takes less time than making a full size hat. We held the wire in place with masking tape and used a version of buttonhole stitch with an extra twist round the needle to attach the wiring. I’ve shaped mine into a tricorn brim, although it won’t strictly speaking be a tricorn as it will have the wrong sort of crown. The wire needs to be shaped before the petersham is added to the edge so am just beginning to sew it on with a stab stitch hence all the pins. (I was packing up when I took this photo which is why the spare petersham is sitting in the middle.) I think it’s going to look cute. Much better than any old bit of feather, ribbon and wire, otherwise known as a fascinator! I’ve started a Contemporary Millinery course at Morley College on Wednesday evenings, hoping to add finesse and finish to my hats. 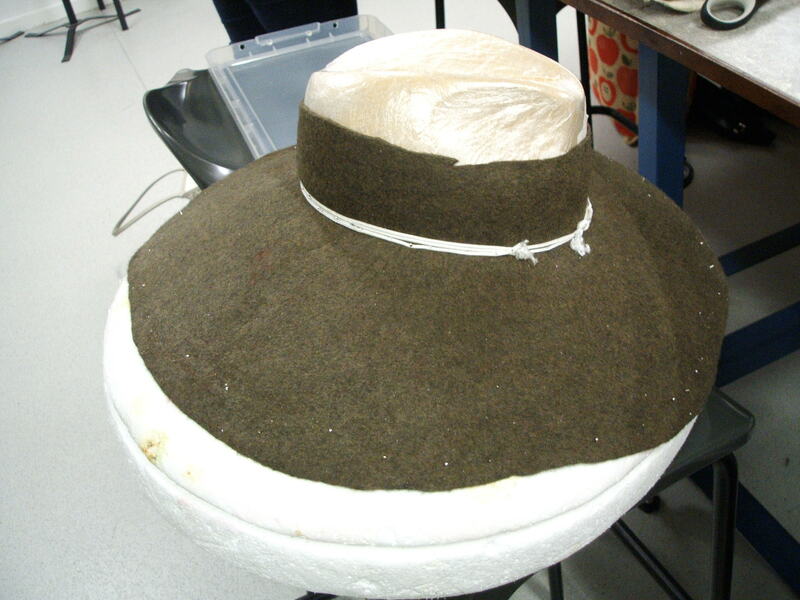 My felt making has definitely improved in technique over the past three or four years – but I thought it would be useful to learn some more about hat construction and finishing. I doubt I will ever be tempted into Couture levels of millinery. 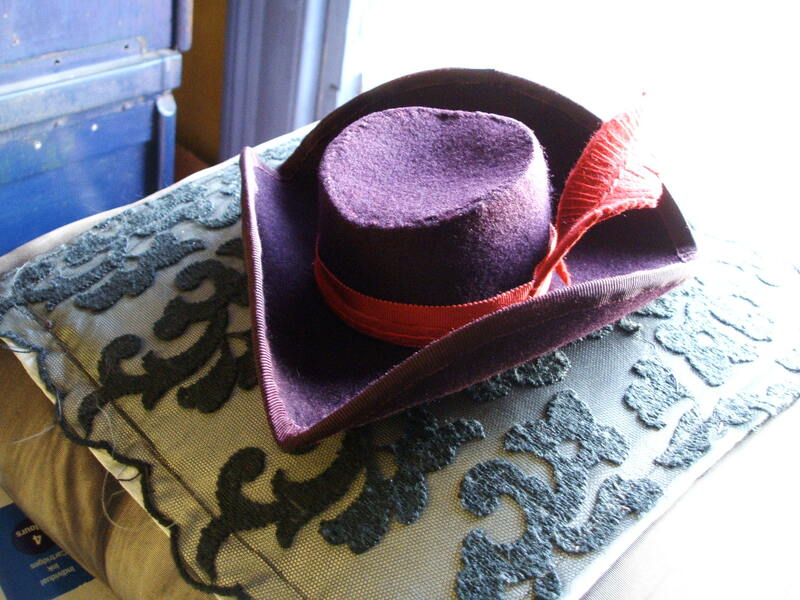 I’m more interested in the everyday hat, with a dose of historical and theatrical hat thrown in. My tutor for the course is Karen Shannon – who has a background both in couture with Freddy Fox and Stephen Jones, and also for film and theatre. I have singularly failed to take any photos in my first couple of classes. We are starting with felt which suits me although I have never worked with commercially made felt before. I guess the techniques will be translatable though once I’ve learned them – steaming, blocking, wiring a brim. We have each bought a ‘cone’ to make a small brimless blocked hat and a ‘flare’ to cut up and make a mini constructed hat (apparently you can’t buy commercial hat felt in flat pieces so you cut it up and steam it flat). Pictures soon when I remember to take my camera. Karen currently has an exhibition at Craft Central in London for anyone who is interested. It runs till next weekend. Although this blog was started to discuss feltmaking embroidery seems to have taken the upper hand of recent times – mostly as it’s easier to carry round and grab the odd half an hour here and there. However apart from those four Saturdays I haven’t really done anything worth mentioning until the recent bank holiday weekend. 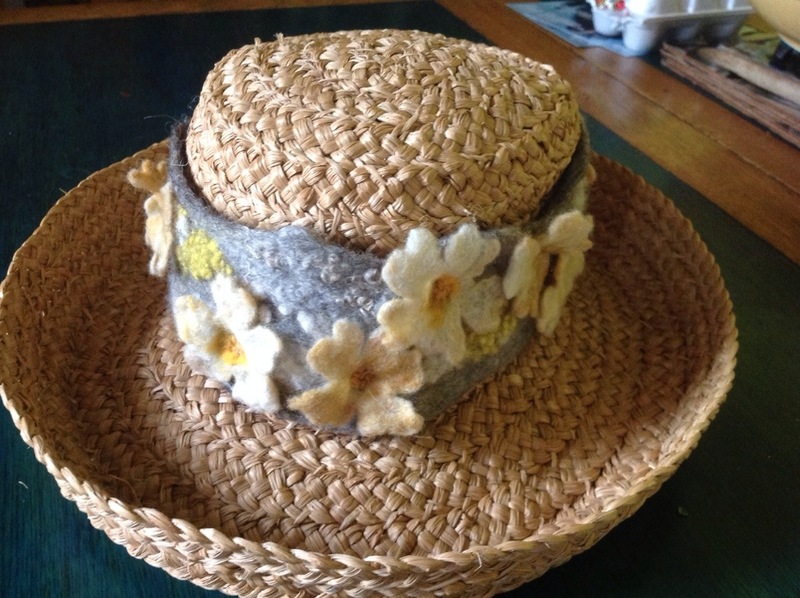 I go to Portugal next month for a week long feltmaking holiday with Nicola Brown, and I thought I really ought to get in some practice – so I felted a new hatband for my straw hat (I am hoping the weather will justify wearing it!!) The design is based around a bowl I produced in Heather’s course. The grey background references stone walls and lichen, and the flowers are made from some of the naturally dyed wool I brought back from Wild Rose in Scotland last year. I carded this together with some bought Shetland and silk mix. They are primroses although a bit big to be naturalistic – I really must get it into my head that Shetland doesn’t necessarily shrink as much as Merino! But I am pleased with their delicacy. I decided as they were on a hat I didn’t need to felt them as hard as I might other items. I even used some embroidery wool to add a properly primrose like yellow centre. I debated whether to put some leaves in, but ultimately thought that the more two tone yellow and grey was rather lovely and I didn’t want to disrupt it with any green. Christmas Fairs past and to come…. 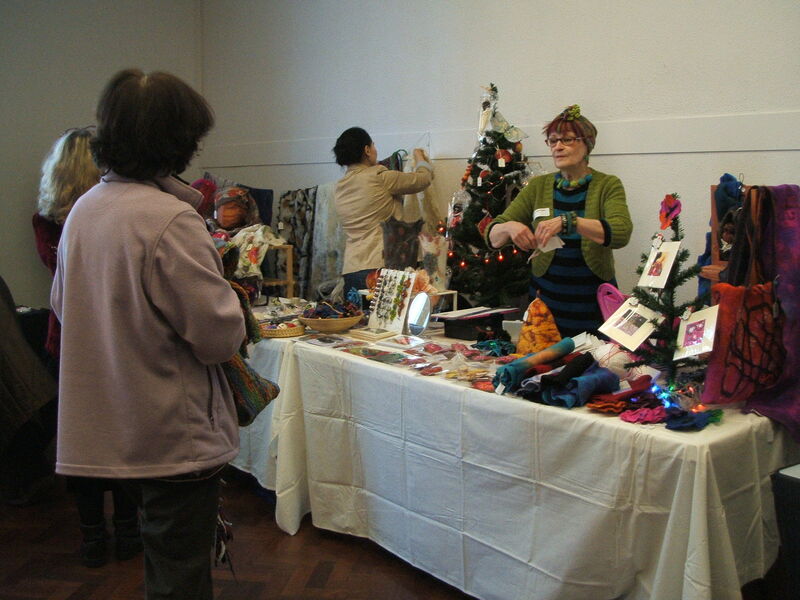 I was at the Morley College Christmas Fair on Sunday with the collective ‘London Loves Felt’ – the fair was really buzzing and seemed to go well. I didn’t have a lot of work on the stall as I haven’t really done any felt making since April – life events have rather taken over. But I made a bit of money with some of my old stock (the bits of it that hadn’t been banquetted on by the dreaded moth….) and some new cards with my sheep photos on them. 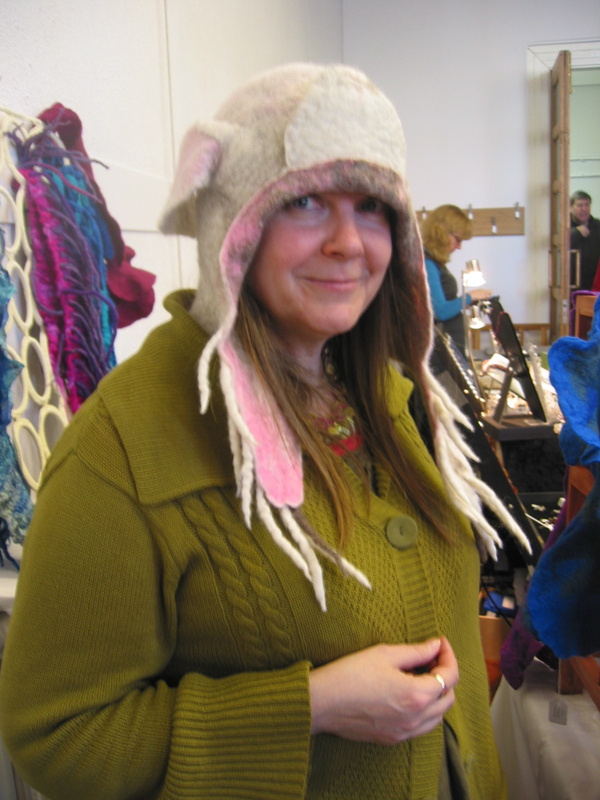 I was channelling a sheep on the day as you can see….